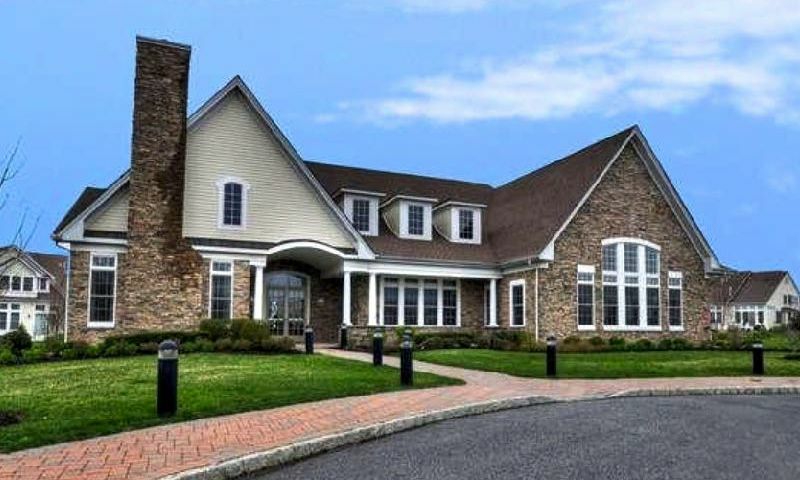 Greenbriar Falls is a lovely 55+ community located in Tinton Falls, New Jersey. This 168-home community includes a charming clubhouse, amenities for socially and physically minded residents, as well as desirable townhomes. A vibrant lifestyle and the exciting culture of Monmouth County have drawn retirees from across the country to Greenbriar Falls. The main hub for activities in the community is the 4,200 square-foot clubhouse. Inside the beautiful clubhouse there is a gathering area with a fireplace that makes the ideal setting for get-togethers. The clubhouse also provides a card and billiards room for exciting games and a fitness center to stretch and tone. For trying out a new exercise routine, residents can use the aerobics studio. Outside, residents can take a dip in the outdoor pool or catch some rays poolside on the patio. Residents can stroll, run or bike along the walking trails that wind through Greenbriar Falls. Additionally, there are two bocce ball courts for those who enjoy a friendly match between neighbors. Greenbriar Falls began construction in 2006 and when completed the community plans to have 168 attached homes. Greenbriar Falls has two townhouse models that are available on a new or resale basis. These beautiful townhomes were designed to be maintenance-free with spacious comfort. These homes range in size from 3,271 to 3,397 square feet and feature three bedrooms, two-and-a-half bathrooms, and a two-car garage. Most homes also include a basement, nine-foot ceilings throughout the first floor, granite countertops, and hardwood floors. At Greenbriar Falls, residents enjoy a truly maintenance-free lifestyle allowing them more time to enjoy their favorite activities and hobbies. Active adult residents enjoy their lifestyles with like-minded neighbors in this 55+ community. With a monthly fee that covers snow and trash removal as well as lawn and common area maintenance, Greenbriar Falls residents will enjoy more time to pursue their hobbies and interests. Whether you are physically or socially minded, there is something for everyone at Greenbriar Falls like joining a game of billiards, cards, or joining in on bocce ball. Greenbriar Falls is located in Tinton Falls, New Jersey just two miles from Garden State Parkway. The town of Red Bank is conveniently located next door and offers a plethora of restaurants, boutique shops, and daily conveniences. Residents of Greenbriar Falls will enjoy the exciting attractions in Red Bank that include theaters, wine tastings, and proximity to the Navesink River. For day trips or weekend getaways, residents can take a train to Newark or New York. Golf enthusiasts will love the numerous golf courses nearby like the Jumping Brook Country Club, the Colts Neck Golf Club and the Old Orchard Country Club. With so much for residents to do both near and far with beaches, shopping, restaurants, culture, and entertainment at their fingertips, living at Greenbriar Falls in Monmouth Country, New Jersey allows active adults to make the most out of their golden years. Clubhouse - 4,200 Sq. Ft. There are plenty of activities available in Greenbriar Falls. Here is a sample of some of the clubs, activities and classes offered here. 55places.com is not affiliated with the developer(s) or homeowners association of Greenbriar Falls. The information you submit is distributed to a 55places.com Partner Agent, who is a licensed real estate agent. The information regarding Greenbriar Falls has not been verified or approved by the developer or homeowners association. Please verify all information prior to purchasing. 55places.com is not responsible for any errors regarding the information displayed on this website.